I did not tell Brett it was okay for him to turn eight years old, but he has gone and done it anyway. Not being given much choice I agreed to make him the birthday cake he wanted. When Brett turned two years old I got to plan his whole birthday party and choose all the cutest stuff myself. 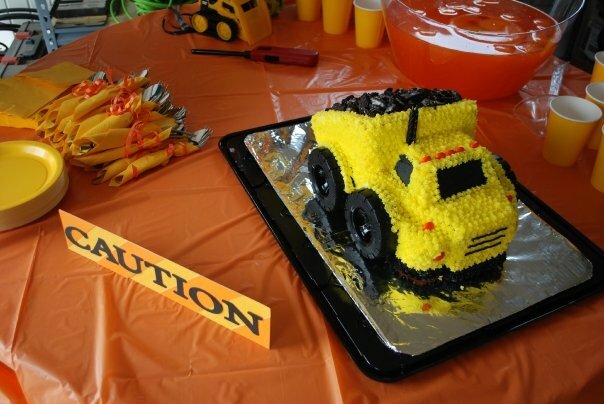 I spent hours making an unrealistic but totally adorable toy dump truck looking cake. Even when he turned five I had lots of design input. 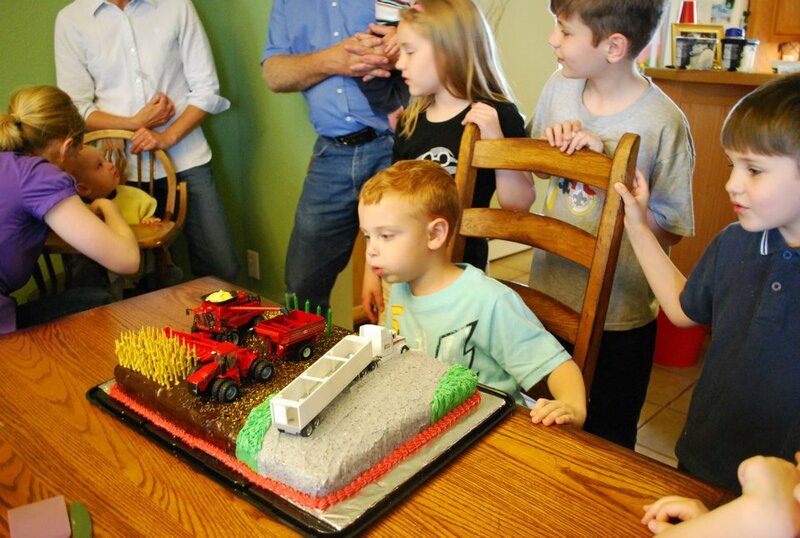 But now I have a grown-up farmer on my hands and only the most true-to-life cake is allowed. 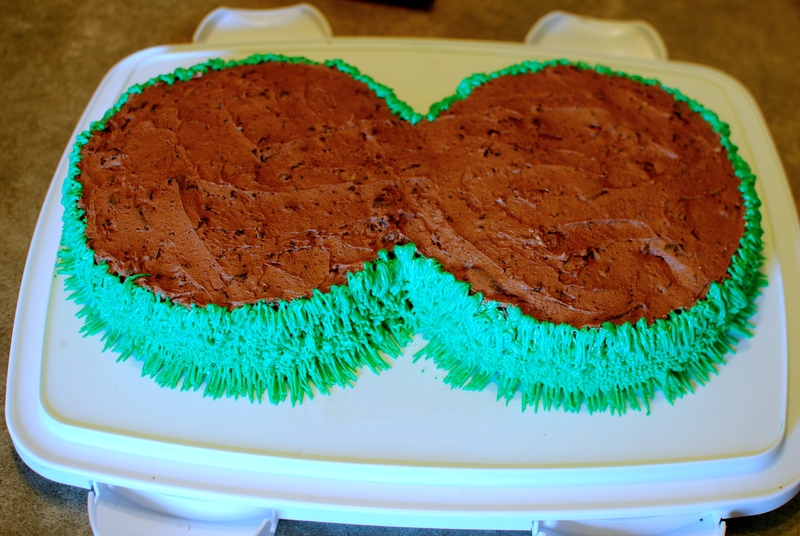 I started with two round cakes to make the number eight. 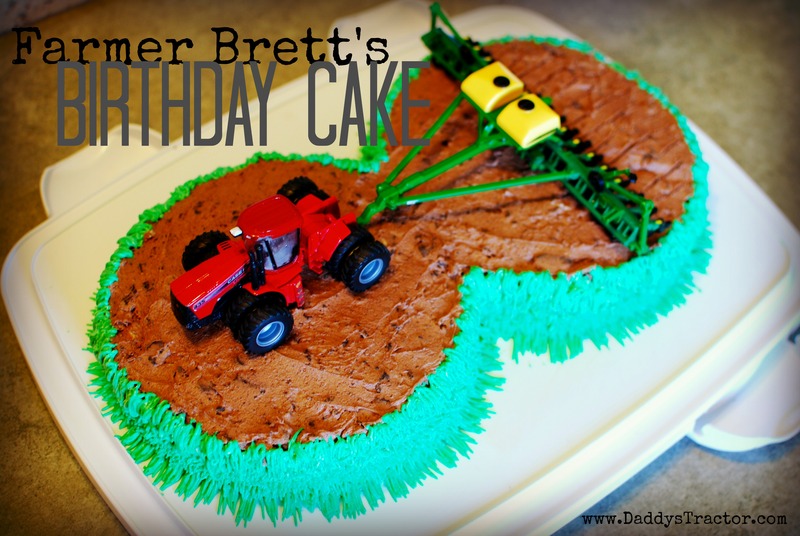 Brett looked and looked at cakes in the shape of a four and five on his Pinterest board, but eventually picked a rectangle cake because it was the most realistic. My plan was to surprise him with the eight he wanted and the decoration from the other. That’s Oreo cookies mixed with chocolate icing and green grass piped from a Wilton 233 tip. It was super easy since the grass doesn’t have to be perfect! Then I (thoroughly!) washed the tractor and planter he chose from his collection. I wanted all red equipment, to make the cake cute. Brett wanted the planter and tractor just like Daddy’s. and used a toothpick to make the marks in the soil from the row openers. This was a bit of a risk because I single-handedly chose to make marks for corn, not soybean seeds, and Brett had wanted to be planting into cornstalks. 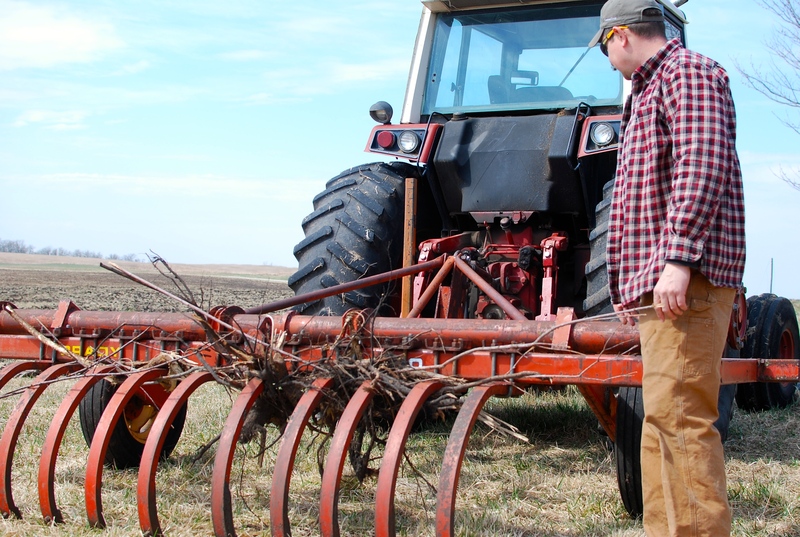 Since we plant on a rotational bases, this would mean the planter was planting soybeans, but Brett’s idea for making cornstalks was broken toothpicks. I told him we could put broken toothpicks on top, but we wouldn’t be able to eat it. So I guess we compromised and I think it turned out cute and realistic. Because believe me, more of our farms are shaped like a number eight than a rectangle! If you’ve never made a quiet book before, well, you’re smarter than me. I’ve made six in the last few weeks. My latest creations have two important characteristics that made me think I should share them on the blog. 1.) They are farm themed. 2.) They’ve gotten much better and MUCH simpler! First! This tip helped me SO much. 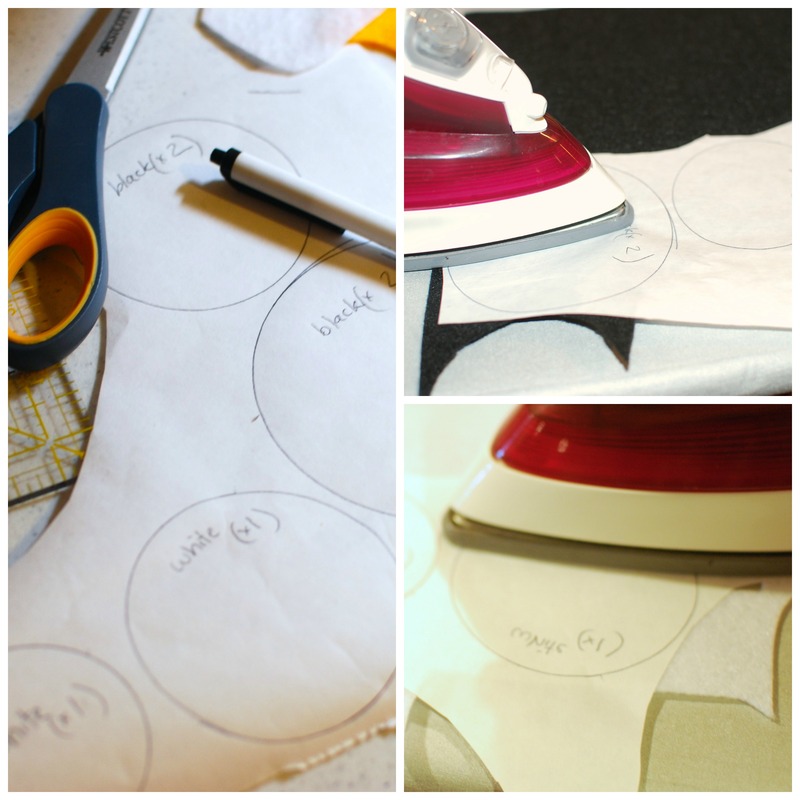 Draw or print your pattern onto paper then trace the pieces onto freezer paper. Then roughly cut the shapes out of the freezer paper and iron them (medium high heat) onto the felt. Felt stretches easily and can become misshaped– never work with just one layer! 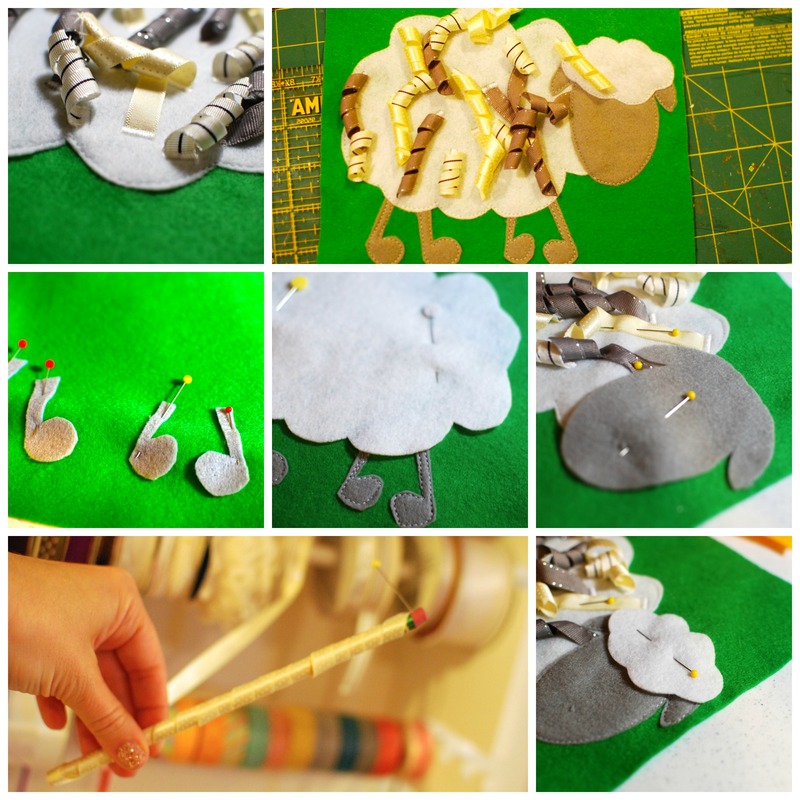 After you’ve cut the felt the second thing you’ll do is join it up with another layer. Some pieces will be sewn to the page, other shapes you’ll need two of. Many directions have you cut two, let’s say trees, and sew them together, but again, stretching. 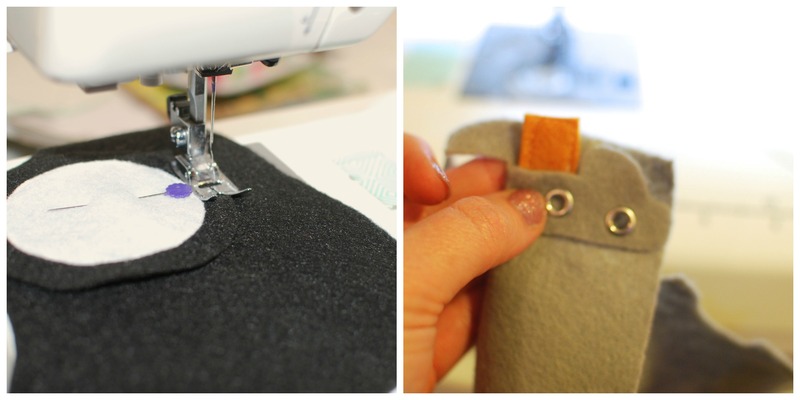 If you sew it to a plain piece of felt, like the tire and pick-up below, you can cut the finished shape when you’re done and it will look perfect every time! 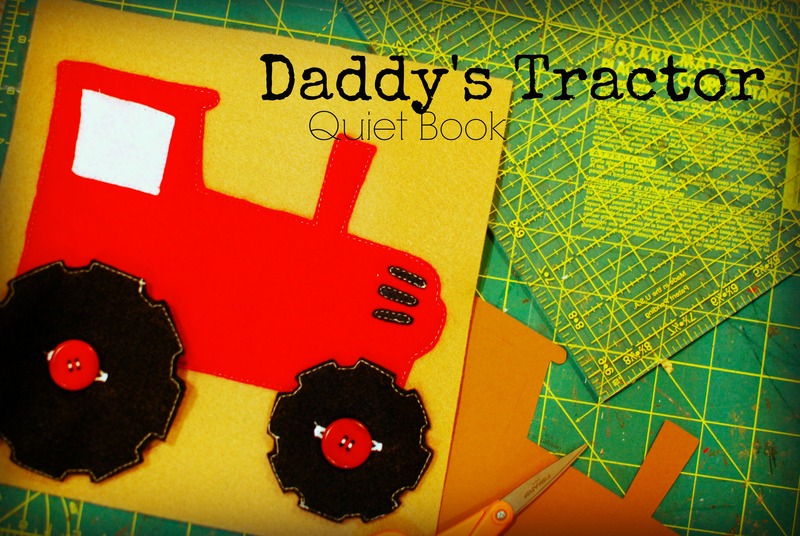 Obviously you’ll need a “Daddy’s Tractor” page first! This one has changeable tires for button practice. Needle, thread, sewing machine, etc. 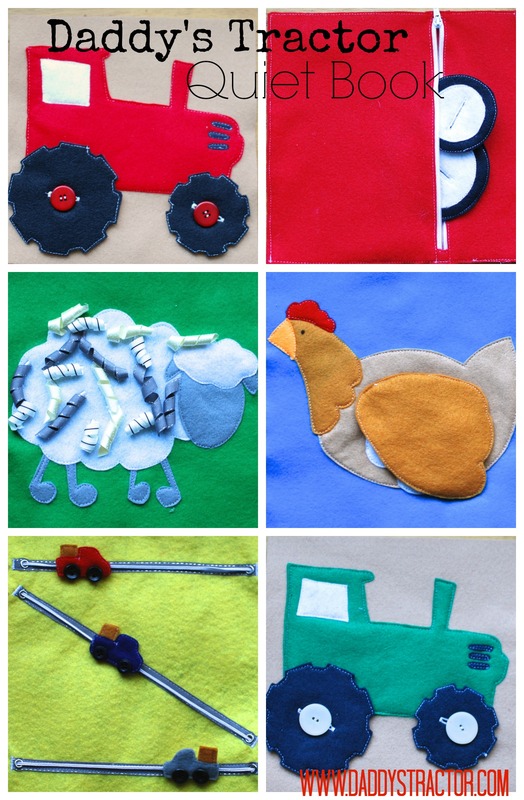 Trace a tractor outline, windows, and three grill vents onto freezer paper. Cut and sew these pieces onto the background felt. Then trace and cut the tires. Sew the white rims to the black felt, then do the double layer thing I described above with the black. Add a button hole to the center of each tire. Using the tires as guides, hand stitch the buttons in place. Curled ribbons make great sensory play! Start by creating the curled ribbon. Preheat the oven to 225*. Wrap the ribbon around a dowel rod (I used a pencil!) and hold in place with straight pins or clothes pins. Bake the ribbon for 20 minutes and allow to cool completely before removing from the dowels! Meanwhile, cut a fluffy sheep shape, head, legs, and fluffy head piece. Start by sewing the feet, then body. Here I added the curled ribbon by using an embroidery stitch to keep them in place. Whatever you use you don’t want a child to be able to pull them off! Next add the head, followed by the wool on top of the head, keeping ribbons out the the way with straight pins. Lift the flaps, and then lift again! make this page lots of fun! Start by sewing the body to the background, followed by the neck, beak, and comb. 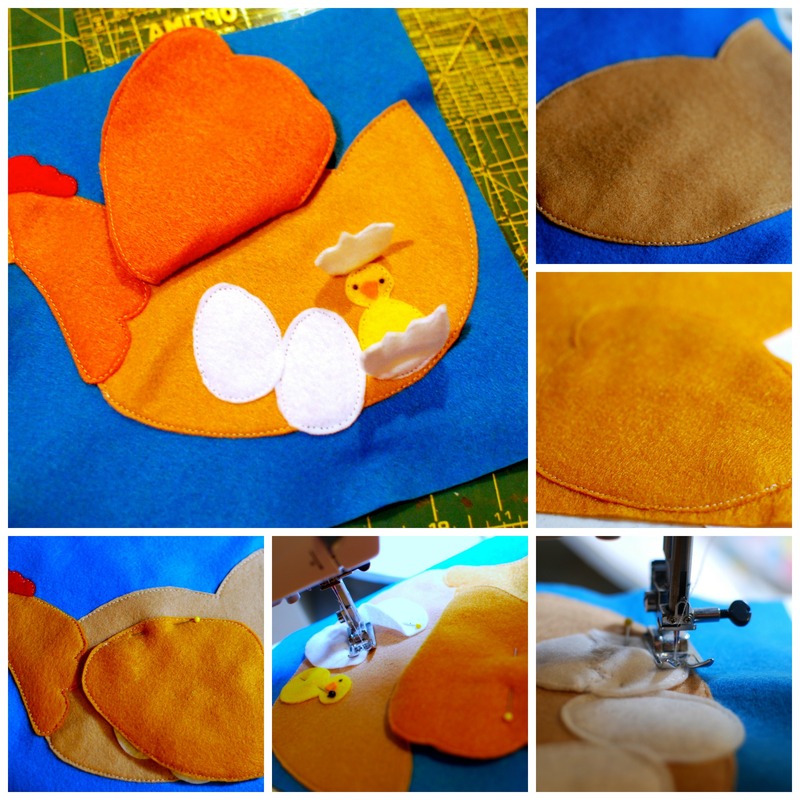 Make a double layer of the wing and attach it to the body with a straight pin. Then pin the wing back up and out of the way to arrange the eggs and chick. Next, make a double layer of the cracked egg shell and sew about an inch of the top and bottom to allow the chick to show through. I added eyes to the chick with a Sharpie and used fabric glue for its beak. Use your pick-up to bring hay for the cows! 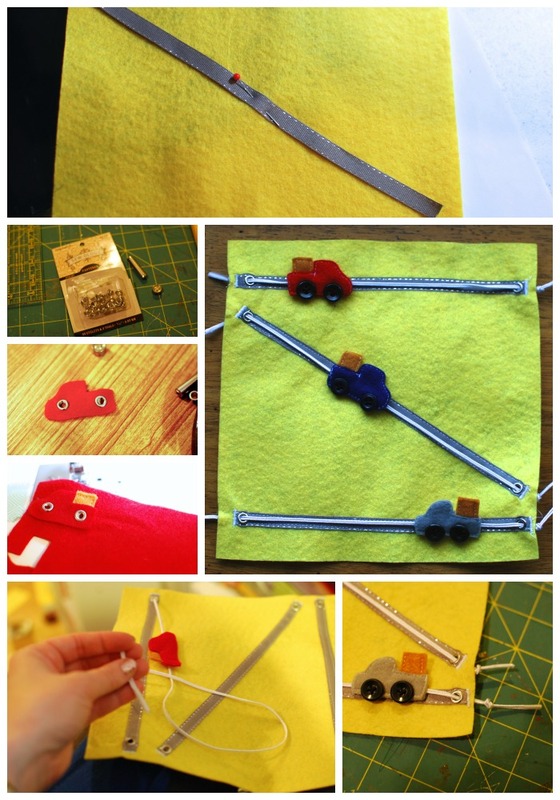 Cut, pin and sew ribbon into desired path. Next, following the directions on the package, insert an eyelet into each end of the ribbon. Then, cut truck shapes from each of the three colors. 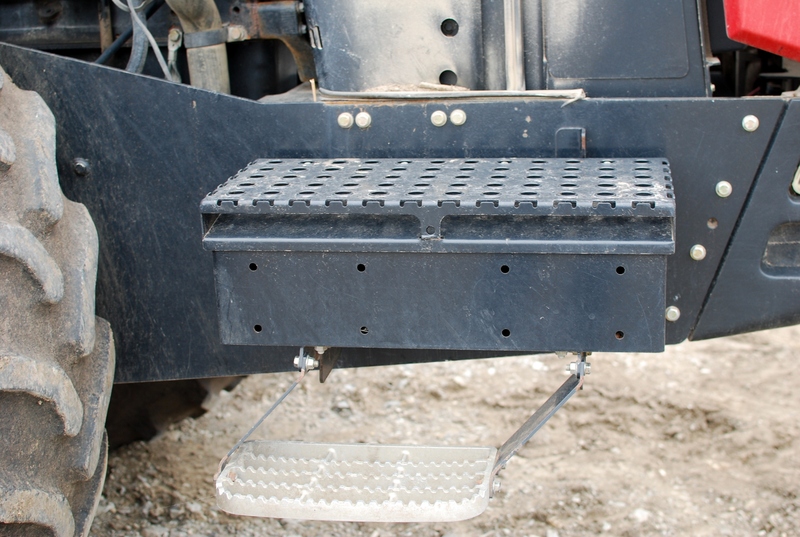 Add two eyelets to each truck where you want them to set on the track. Cut and sew a double layer of hay bales. Before sewing a double layer of the trucks, slip a hay bale into the back of each pick-up bed. Now sew on the button wheels, being careful not to sew through the space between the eyelets on the back of each truck. Then, thread the cording through the eyelet in the ribbon, through the eyelets on the back of the truck, and through the last eyelet in the ribbon. Add knots to the end of the cording and use an embroidery stitch to finish off the edges of the ribbon, making sure to catch the cording in the stitches. Last I added a pocket for any extra pieces, made small button holes down each side and attached them with book binder rings through them. Easy to slip in and out with new pages as your kiddo grows! Question. 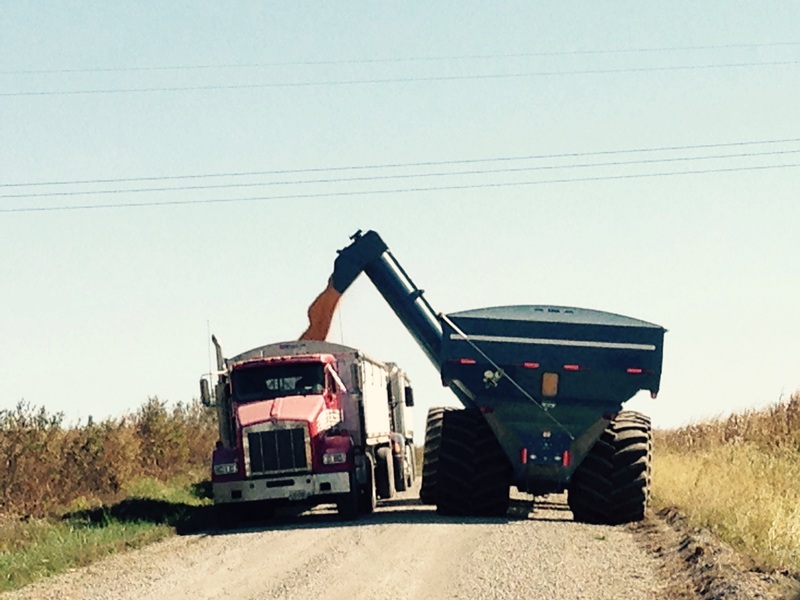 How do you move corn from one grain bin to another? Answer. Not easily. and the semi unloads into the grain bins. But moving corn from bin to bin isn’t something we’re set up to do easily. So when we needed to move some grain around Daddy planned for a full day of unloading grain into the semis the way we do when we take it to the elevator to sell it and then putting it back into the new bin we way we would from the field. And then they came up with this. On your left you see the yellow stream of corn as it comes out of the bottom of the bin and a grain vac brings it up to dump into the wagon. The wagon’s bottom is open, allowing the corn to dump right into the next auger, which transports it across the lot into the semi. The semi’s bottom is also open, dumping corn into another auger, which then lifts the grain up into the proper bin. The tractors are there to provide power for this little operation. They have hook ups in the back that allows them to transfer energy from their engines to the augers. A nicely set up operation might have a grain loop to accomplish this with much less effort. But where’s the fun in that?! The farm is a busy, bustling place in the springtime! The kids and I keep busy randomly adding critters introducing productive livestock to the backyard pasture and Daddy, well, we’re always glad when Sunday rolls around and we get to see him! Some of you may be lucky enough to live on a farm and understand the process of planting, but for those of you who would like a clearer picture of how your food is grown, well, maybe this will help! We can even grow sweet corn! Why we’re so busy in springtime! It’s literally the most important thing that happens on our farm and it’s happening now! Just ask the little red hen, if you want to eat the bread, first you have to plant the seeds! 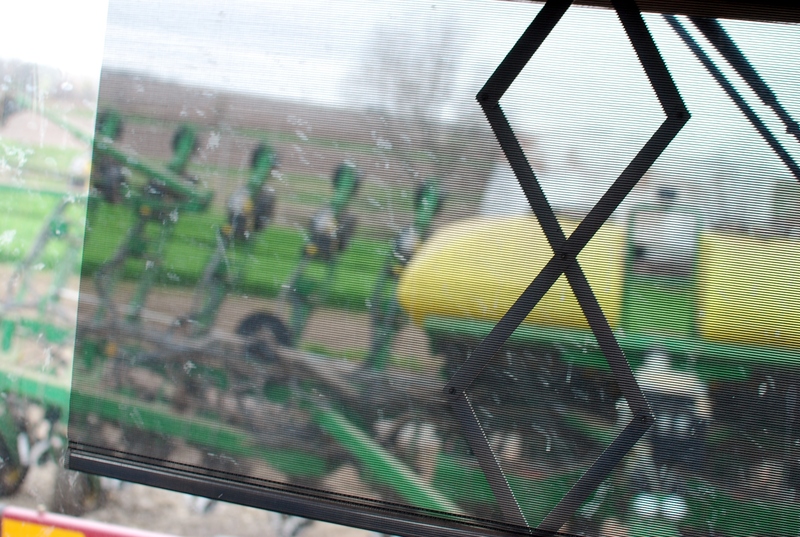 Planting time is the most intense season on the farm. 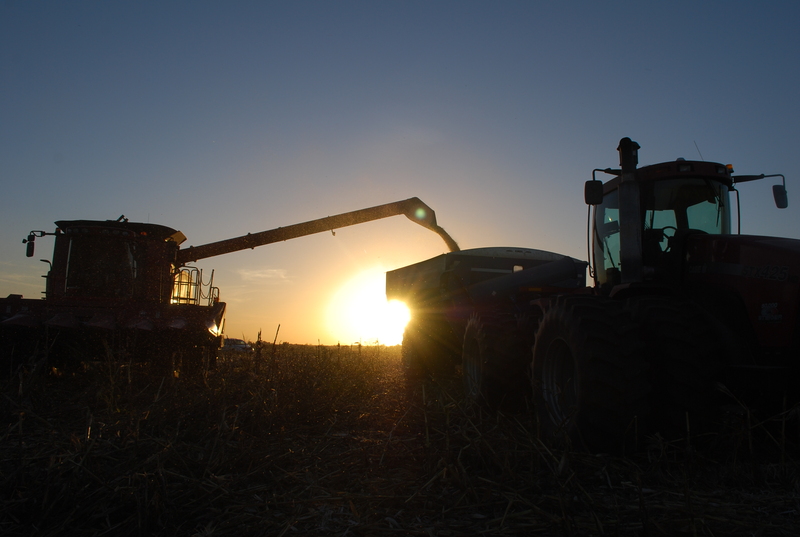 There are an estimated 10 days that are just right for planting corn in our area. Even if we had perfect conditions (which we won’t) and no break downs (that won’t happen either!) there is no way we could plant all our corn in 10 days. But we try. Daddy has added lots of Precision Planting parts to the planter, making sure every seed counts! During the first two days of our planting season the tractor ran around the clock. Grandpa traded off with Daddy in the middle of the night so Daddy could get a few hours of sleep. Anna helps Daddy check that the planter is working by digging up a row and looking at the seeds. It’s also not just putting seeds in the ground that is so time-sensetive. Daddy got out of bed a the usual time the next morning so Grandpa could put on fertilizer and crop protection products, which are every bit as critical. Daddy drove away with a piece of pizza in hand– no time to stop for dinner! Monsoon-like rains put an end to our field work late Saturday night and this morning there is snow on the ground. Like I said, we won’t be getting ideal weather! The weather man says we should be in the mid 60s again in two days with lots of wind as well, so the ground will dry out and we’ll be back in the fields. While not ideal by any means, the snow shouldn’t stop the seeds from growing once the weather warms up. Just please weather, do warm up! 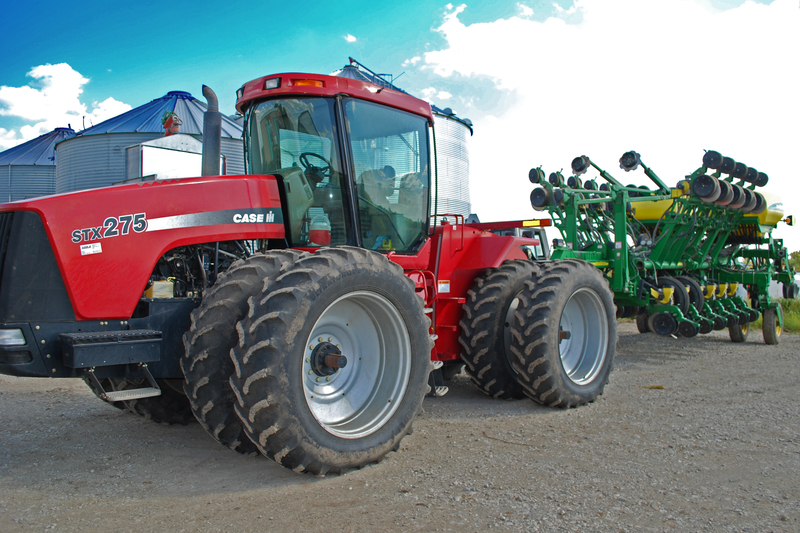 Tractors, planters, sprayers– all equipment you might think about using when spring rolls around. But this year we have been putting a lot of hours on Grandpa’s bulldozer in order to get ready for spring planting. 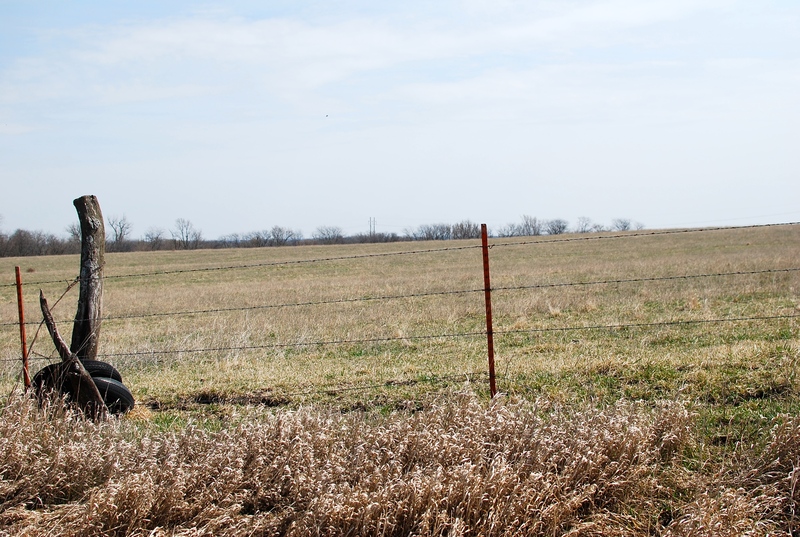 The field just across from our house was pulled from a government program called CRP and the owner wanted to rent it out for the first time in 20 years. 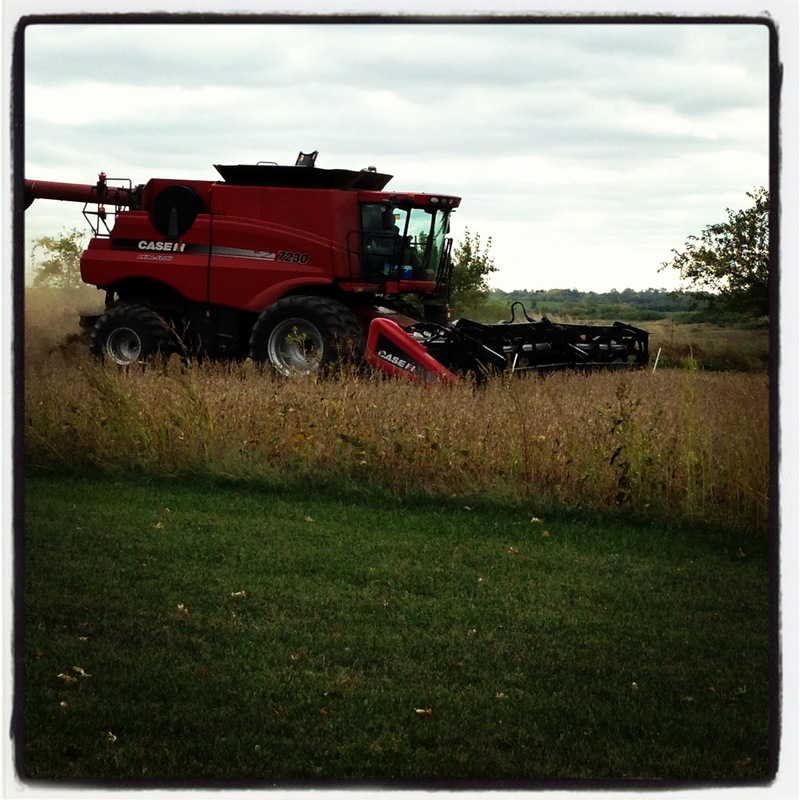 (The CRP program was started years ago as a way for farmers to allow poor production land to rest.) It was mostly great news for us. 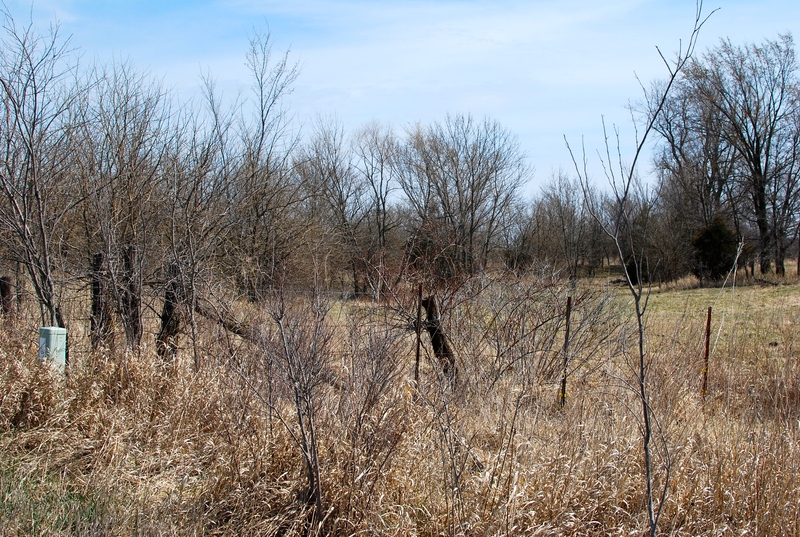 It meant more land that is very close by and a landlord we enjoy working with. 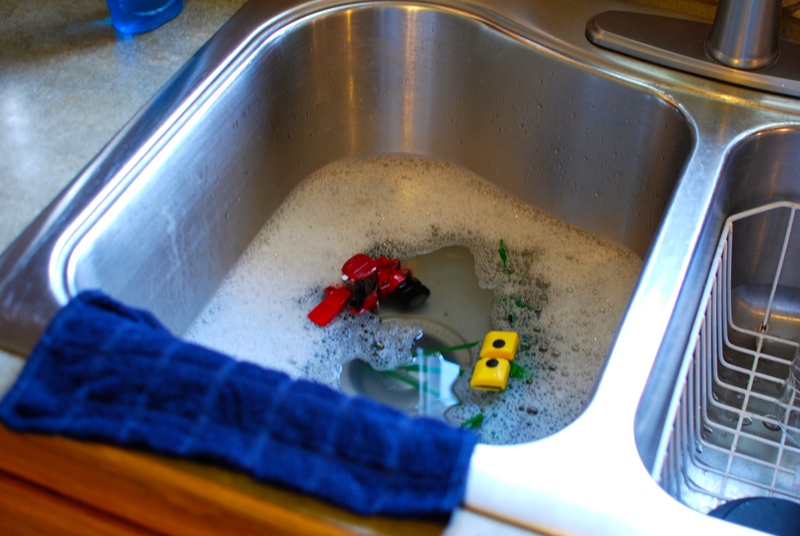 You can imagine the downside if you think of trying to use anything that has been left alone for 20 years! 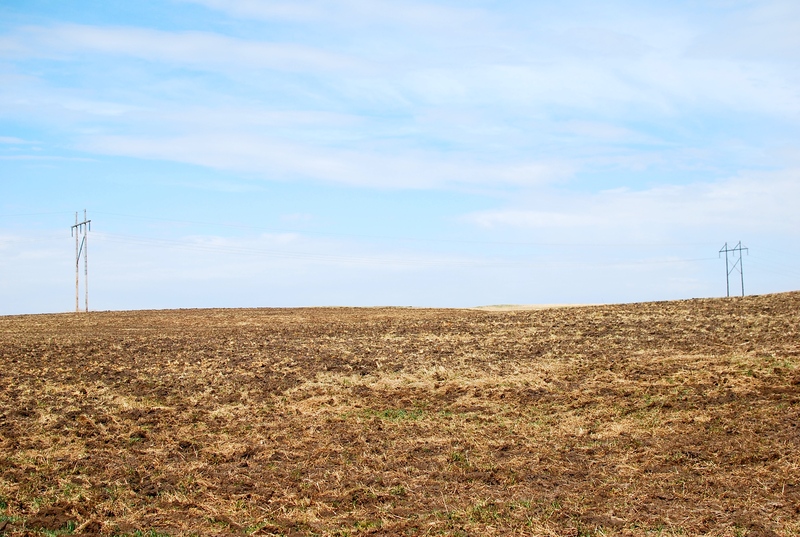 The field looked like this, all 200 acres of it. It has been no easy task to get it ready for spring planting! 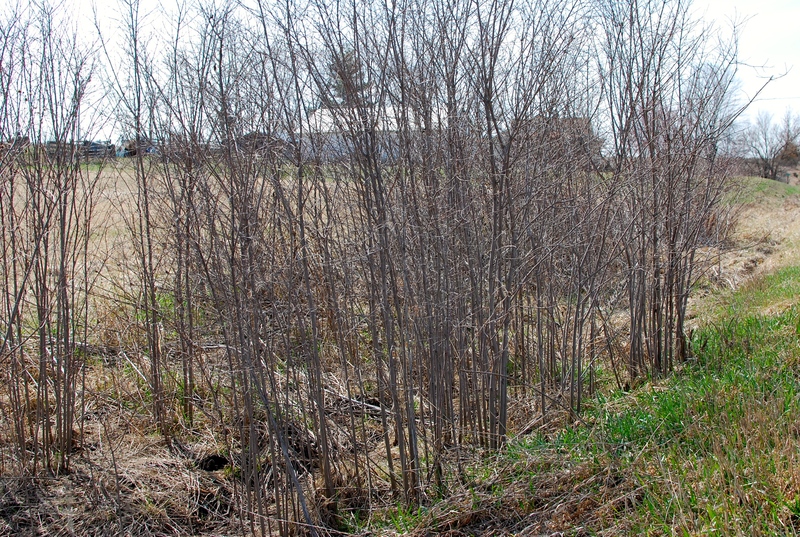 The landowner used a mower to cut down the small trees. Cory used the skid steer to pull out the larger brush and Grandpa has been handling the largest obstacles with the bulldozer. Wayne used the custom cultivator to pick up stray sticks and then whoever is free has been using the tractor and disk to cut up the stalks so the planter and later the combine won’t run into anything capable of tearing it up! Daddy and the guys made this custom cultivator last year to pick up brush. The prongs are close together and all along the back bar instead of spaced throughout. You can see how it catches sticks! 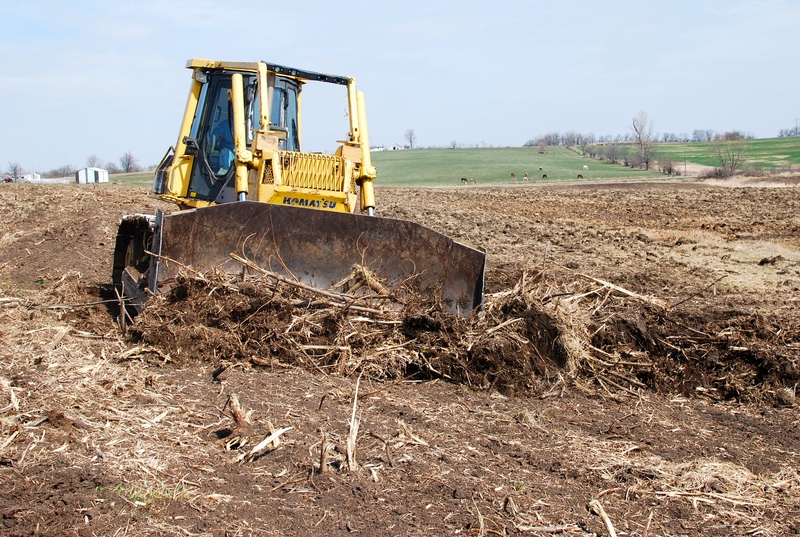 The skid steer can pull small brush and pick up the piles. 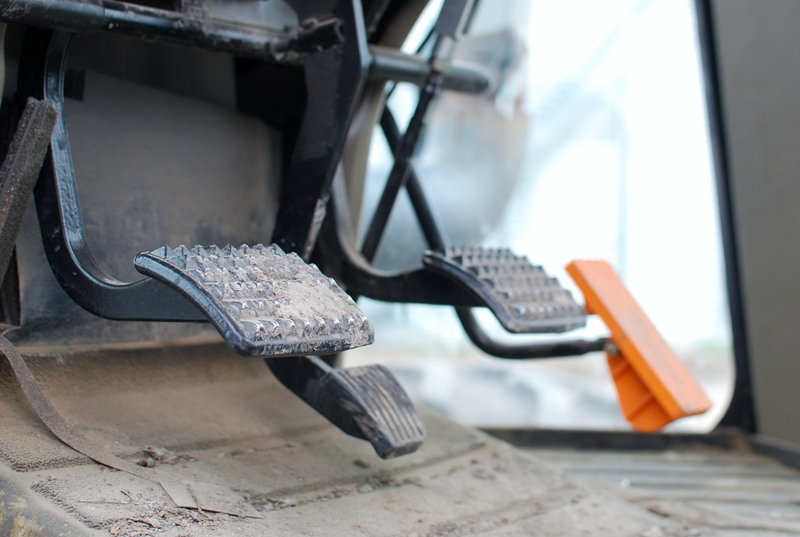 Because the attachment on the front is shaped like claws the skid steer can shake the dirt from the piles, leaving more soil on the field. When the disk comes through it chops up the ground into big chunks, hopefully getting rid of pointy stalks! Last the harrow smooths up the dirt, leaving a happy field ready for bean seeds! The field looks quite different from those first brush pictures, wouldn’t you agree! You may remember from previous posts that, while this field looks picture perfect its not how we usually farm. 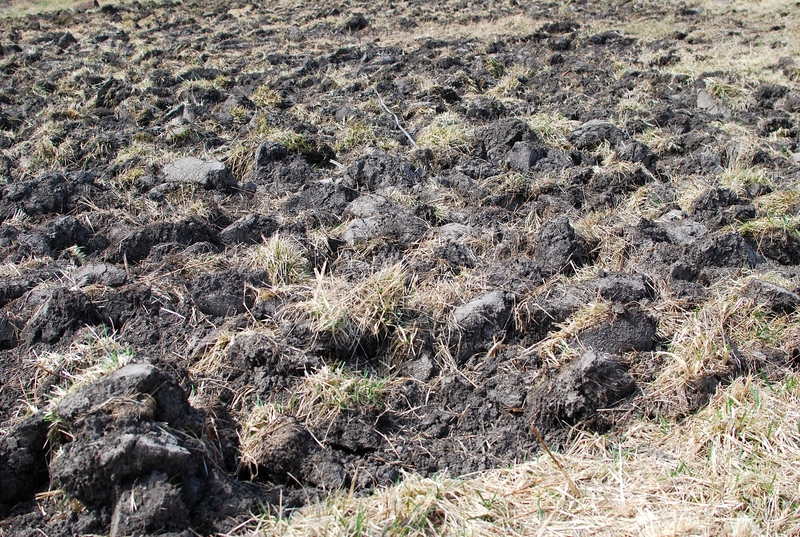 The loose soil can easily wash away leaving our fields without the necessary top soil to grow good crops, plus polluting nearby streams. Grandpa also added to the farm this year, buying the field across from his house. This field connects all four farms, Grandpa’s home, this new farm, our new rental, and the field our house sits on. What a difference in how it looks! This farm will not be worked at all. It’s been cow ground for years but we won’t be tearing up the grass or anything. Instead we’ll simply plant beans directly into the sod. The first year won’t likely be a great one, but taking care of the soil will have more benefits in the long run. 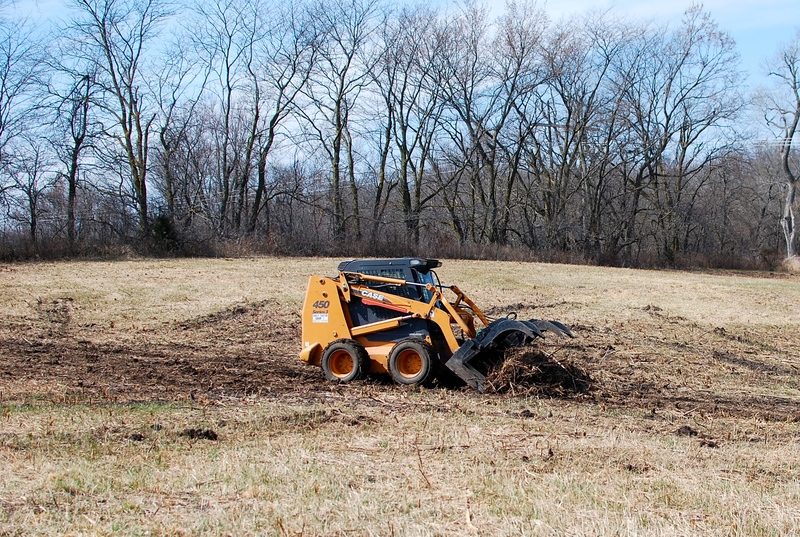 Because really, we’d rather not be using a bulldozer to get ready for spring planting! 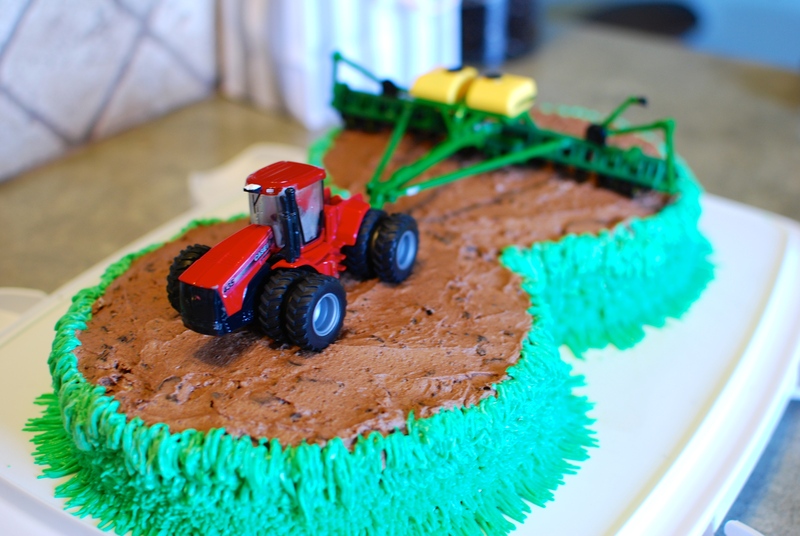 Celebrating Thank a Farmer week is done like most American holidays– it lasts a whole week and has a lot to do with food! 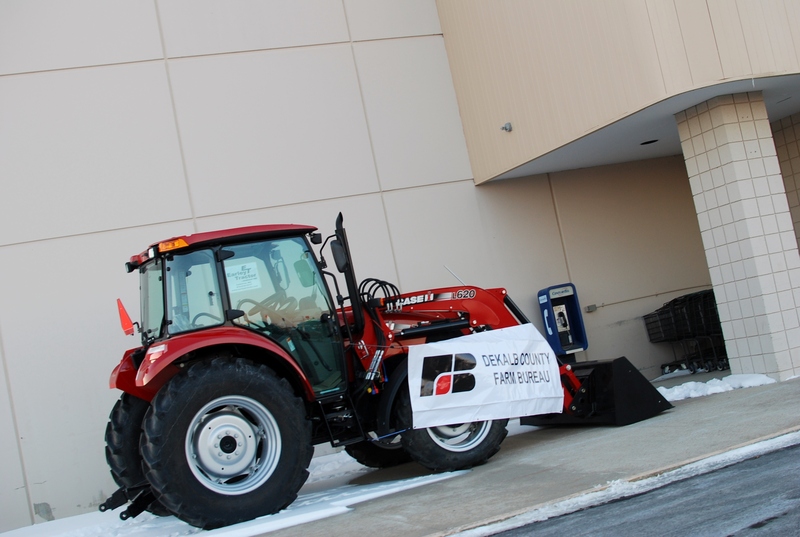 Saturday was the pancake breakfast, then raffling off a grocery store gift certificate, and, new this year, we parked a tractor at the local store! Thank a Farmer and Thank Early’s Tractor Dealership! Thanks to the tractor dealership in town for letting us use one of theirs since it was already clean and only a few blocks from the store! Tractors generally go less than 25/mph, so that’s pretty helpful! Thanks to the county Farm Bureau board members who volunteer their time to set up these functions. Thanks to the grocery stores that work with and support the farming community. And of course, thanks to the farmers who are responsible from everything in those stores from the bananas to the macaroni and cheese to the plastic used to package it all! Check in tomorrow for the next Thank a Farmer post. We’re thanking Daddy for something pretty exciting! I know I’m not the only mom out there going just a little bit stir- crazy! Sure, we homeschool so we’re here all day all the time, but it’s just not the same being stuck inside while the wind howls around and snow beats against the windows! 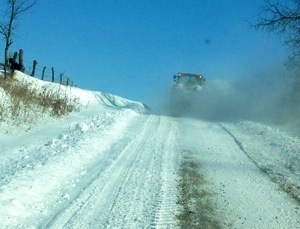 So yes, Missouri Department of Transportation, it was absolutely essential that we leave the house for a little while! Unfortunately, it wasn’t quite that simple. 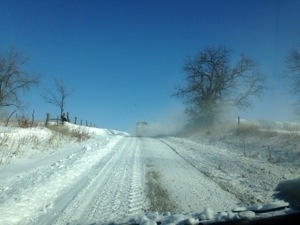 This is daddy driving the tractor in front of us to plow the snow so we can get to the roads. So very grateful to have our own snowplow or this would be one crazy mama! We’d love to have you come out to the farm sometime and take a ride in the tractor. 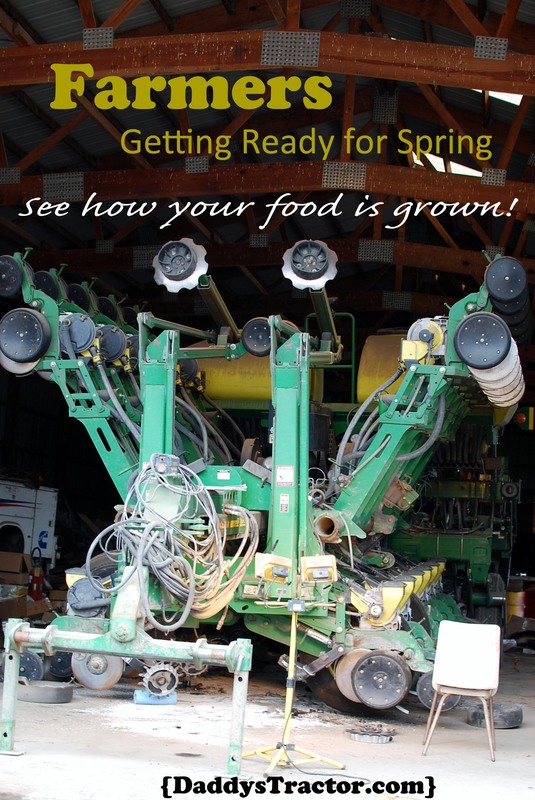 Especially now that spring planting is finally underway! You could watch the monitors, observe the planter action, and bump over the terraces with us, if only you could make it out our way. But if you can’t, don’t worry, because today I’m inviting you to take a tour of the tractor without ever leaving your computer! As you climb up the stairs one of the first things you’ll notice is the handle on the bottom of the door. It may seem odd, but you couldn’t reach it if it were placed in the middle like a car door! The next thing you’ll notice is the pedals. Why? Because they will be eye level as you climb! The one on the left is the clutch, the one on the right is the brake. The little one in the middle adjusts the steering wheel. The yellow is a decelerator pedal. You may notice there is no gas pedal. 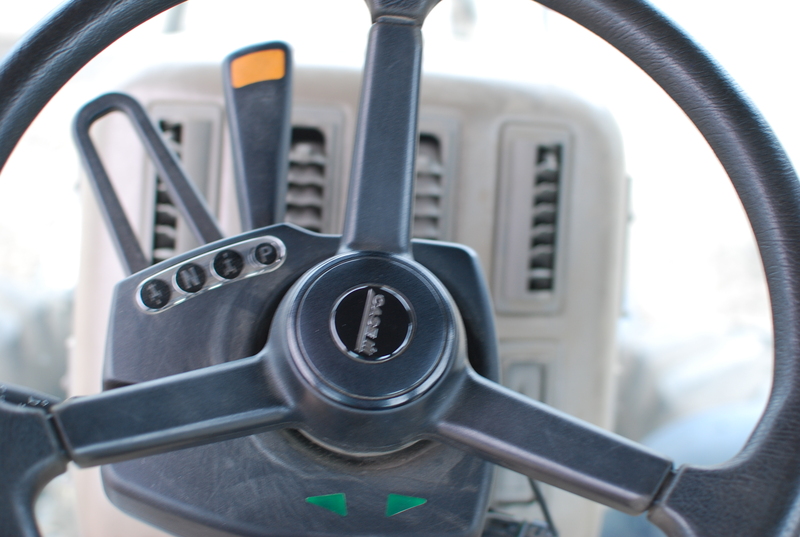 Instead the tractor moves forward by using the clutch, throttle and the orange forward/reverse lever here behind the steering wheel. Kinda crazy, huh? And since we’re now sitting here in the driver’s seat, take a look to the right. 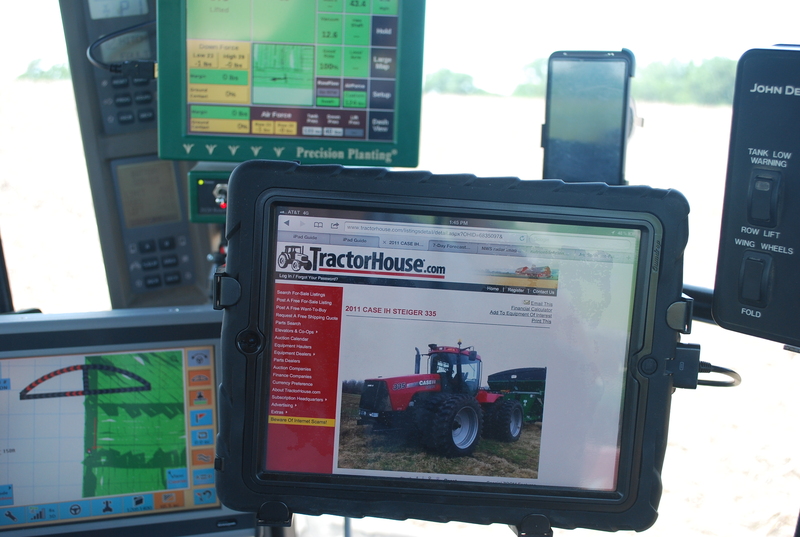 Here you see screens, monitors, control panels, ipad, and smart phone all working together to gather data about what’s happening in the field. Pretty cool! 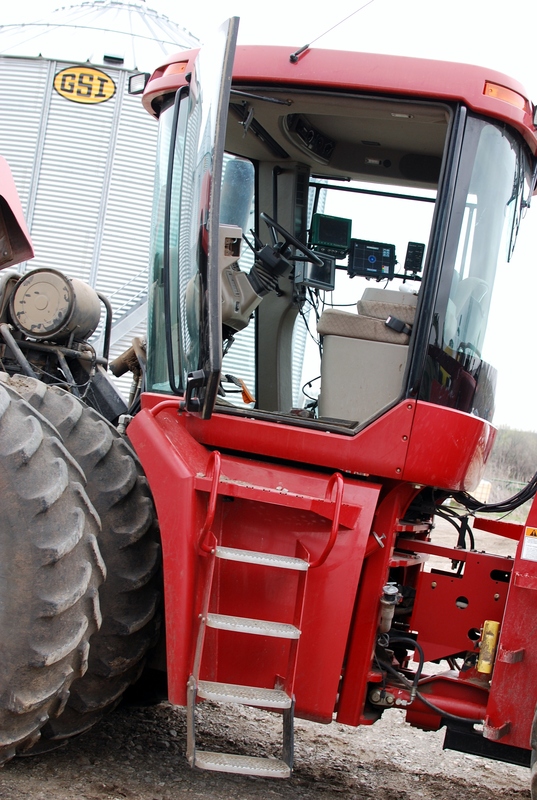 Find out more about our modern tractor technology in this previous post. 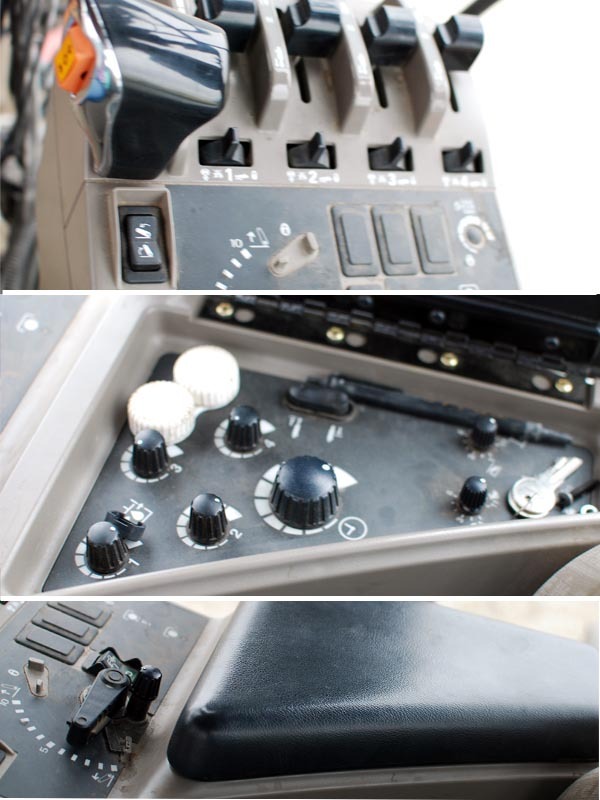 Actually, this side of the tractor has so many buttons and knobs they even store some under the arm rest! Above you are the climate controls and stereo. 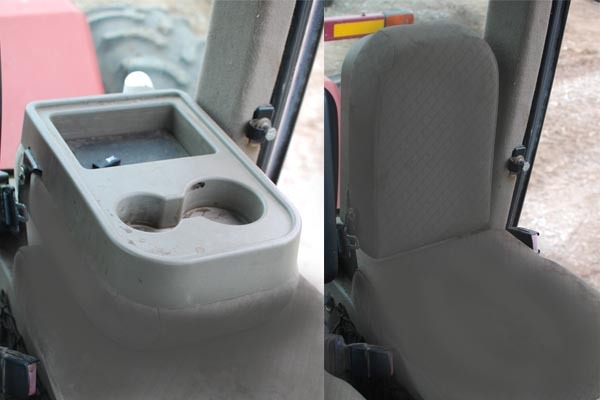 To the left you can enjoy the convenience of cup holders, or…. the buddy seat! Loved by farm families world-wide, this fold down table pops up to hold a child. Or two. Or three! And behind you is the back window, complete with a pull-down sun shade. And if you’d care to climb back down, I’ll show you the outside! 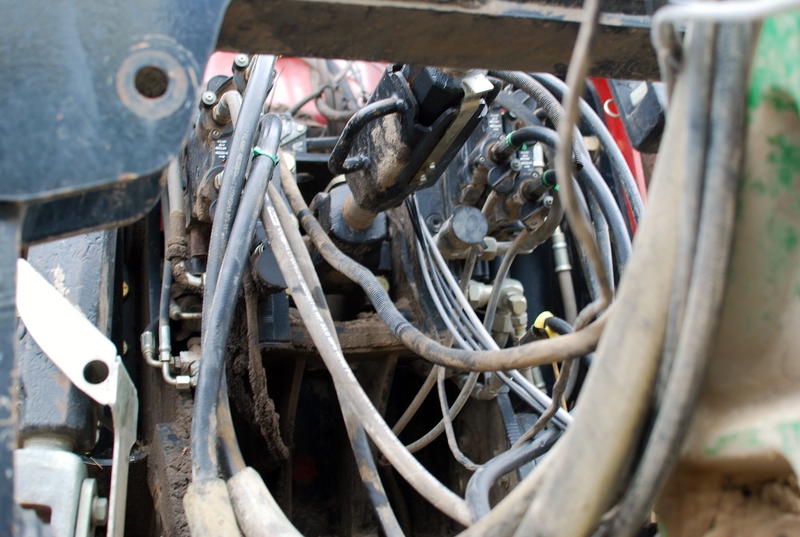 Behind the tractor lots of cables and wires attach from the planter. 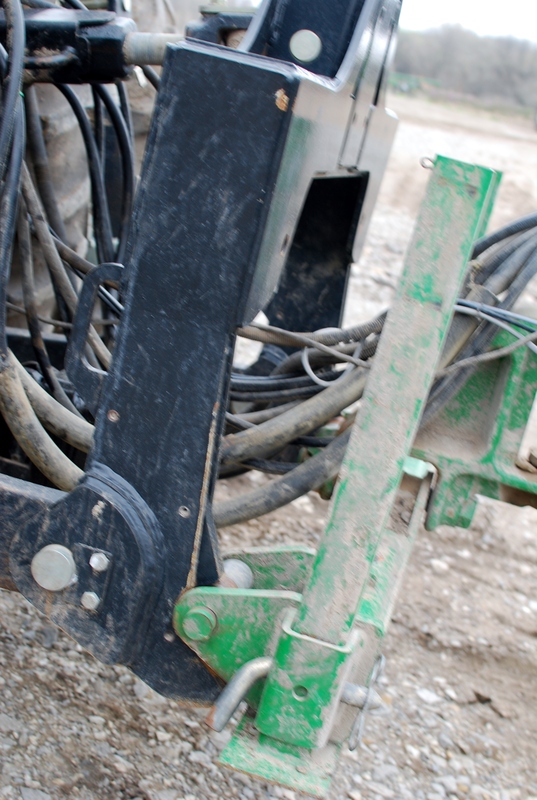 This pic show how the planter hooks up to the tractor with a three-point hitch. Take a look under the hood, but first you’ll have to climb up the steps, maybe even climb up a tire! Case used the space under the step to store a toolbox. Having all the tools you need to fix break downs right in the field is critical since timing is so important to spring planting. 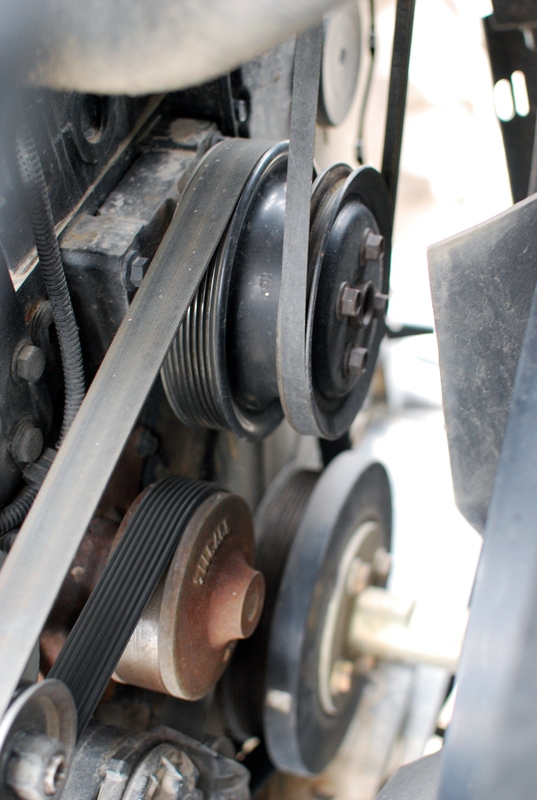 Just a peek under the hood– there is so much stuff under there it would take a whole other post to tell you about it! Hmmm, actually that sounds like an idea! Would you like to stop by again soon? The sun seems a bit shy this year, but despite the cold, Daddy is getting ready for spring planting! Today’s task is getting the planter ready. 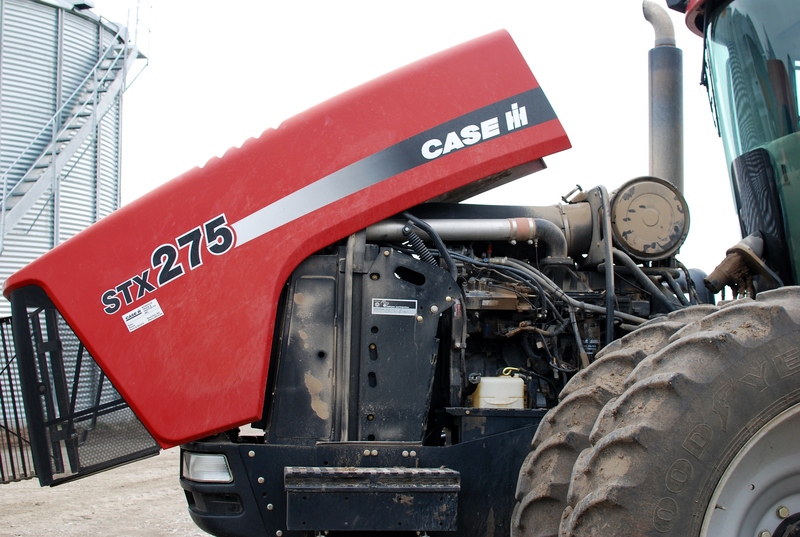 The planter is one of the most important pieces of equipment on our farm because it puts the seeds into the soil. Without that, there is nothing to farm! 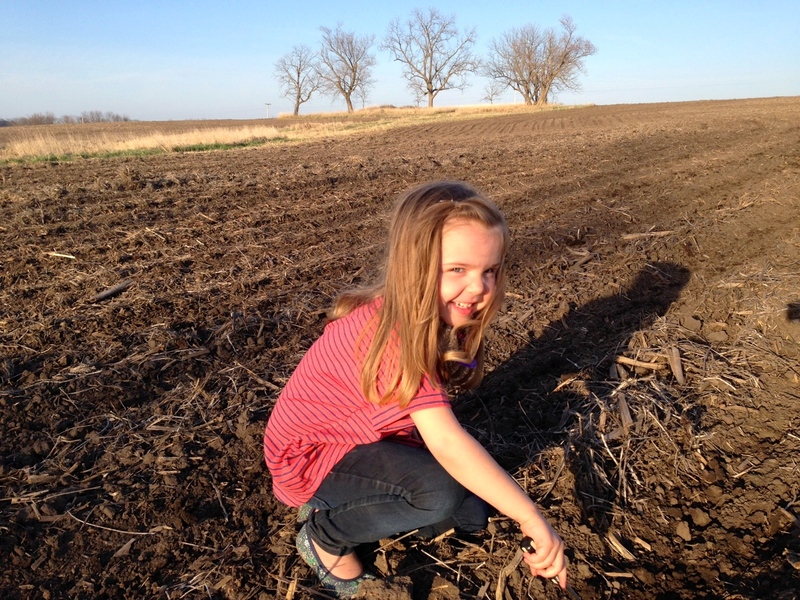 Getting each seed at the right depth with soil pushed in on all sides is a big goal, but Daddy keeps working to make that happen. 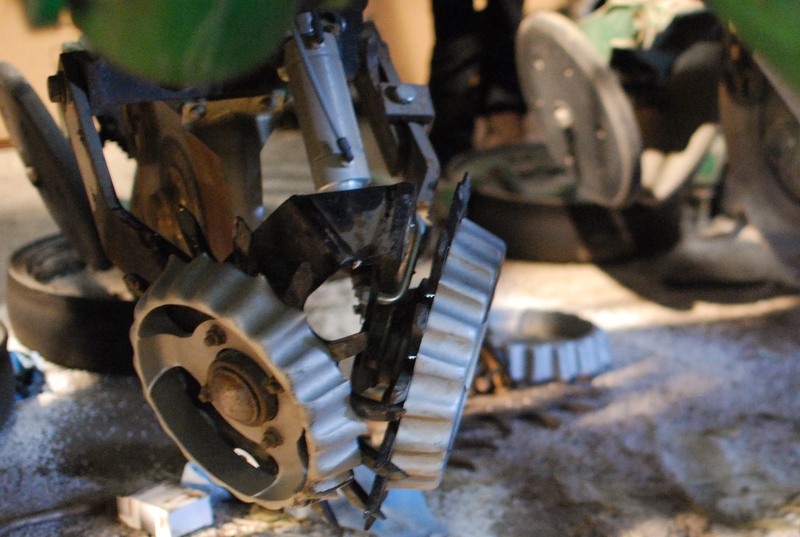 After purchasing the planter we have now, Daddy took off many of the parts it came with and replaced them with parts from a company called Precision Planting. 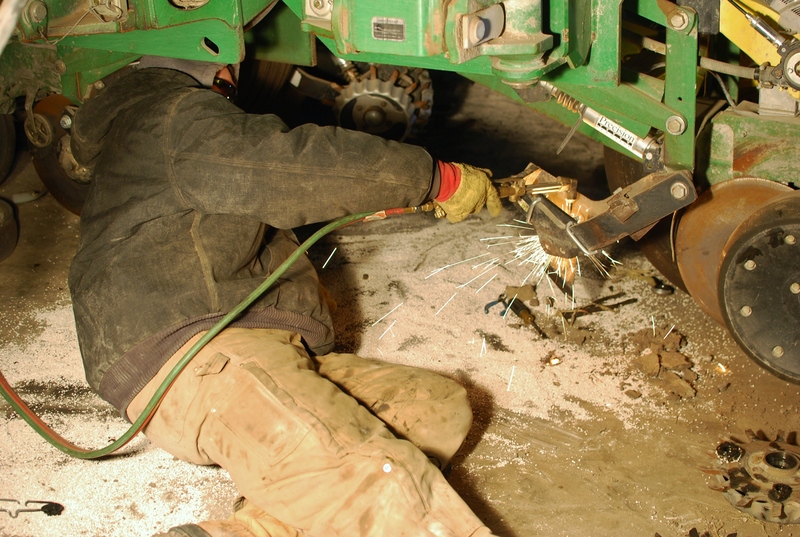 And each spring he checks each part, replaces broken pieces, oils, cleans and otherwise repairs the planter. 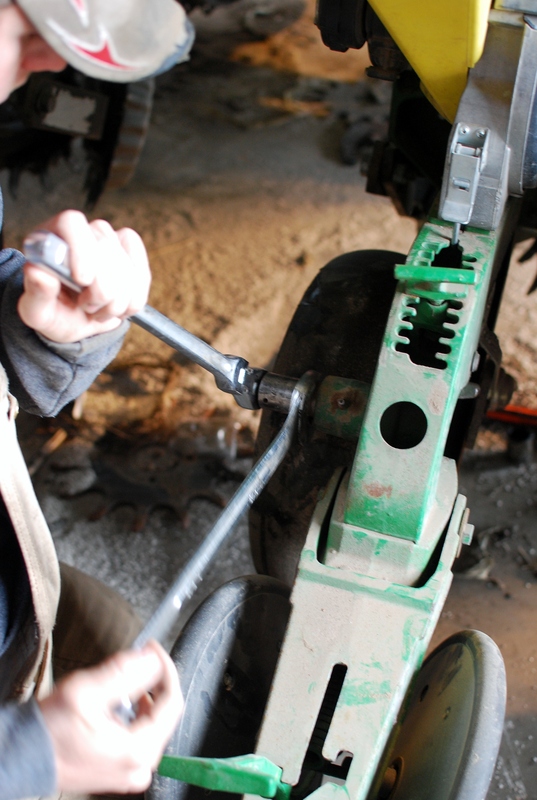 Here you see Daddy using a tourch to remove a bolt that was stripped. This is the part he was working on. These are 16 of these on the planter and each one must be in perfect working order! To adjust the row openers Daddy crawls in under the planter. All is well and good until he needs a tool and has to crawl back out to get it! Brett, Anna, and the farm dog Ben are great help to our hired man, Cory. But Cory gets the job done anyhow! 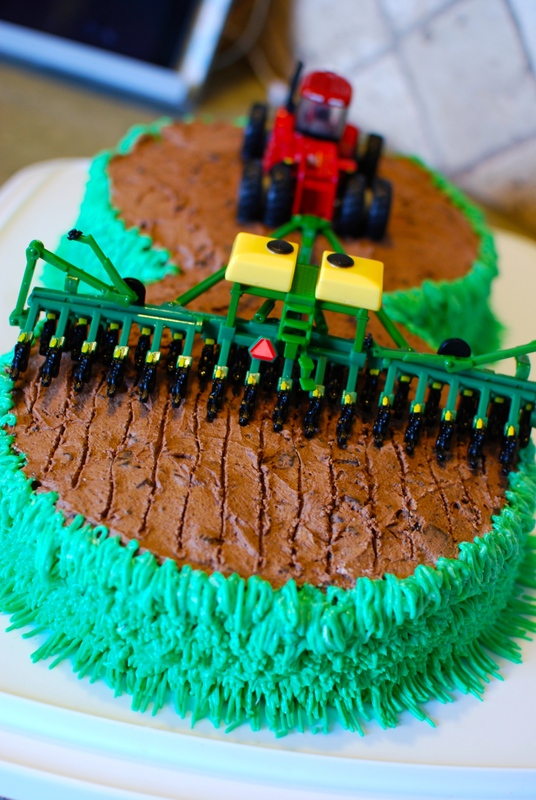 The planter isn’t the only piece of equipment that must be prepared for spring. 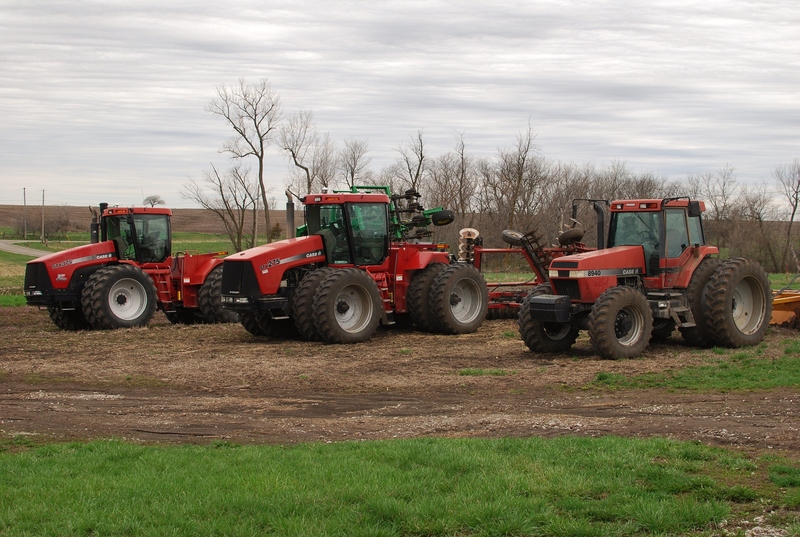 In this photo you see a line-up of the tractors and the equipment they run that are ready for the sun to start shining! 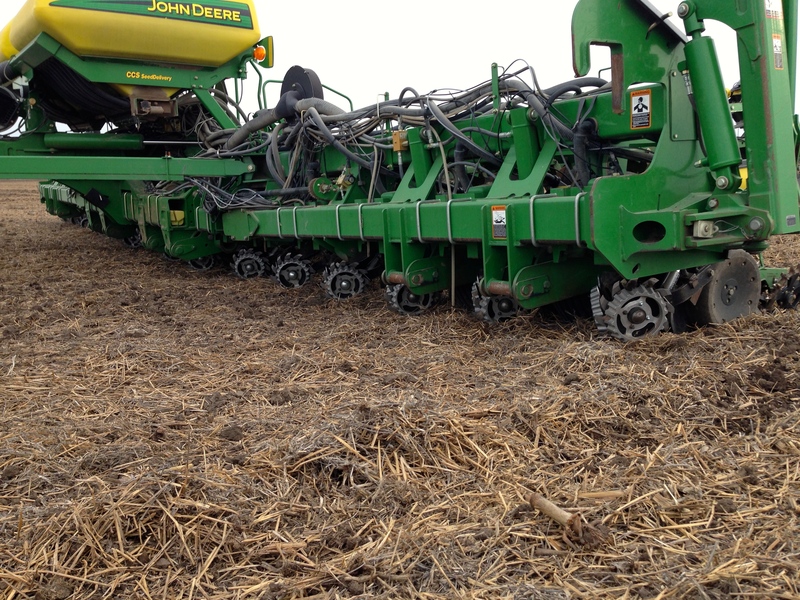 The green and yellow thing on the end may look like the planter, but actually its a drill. 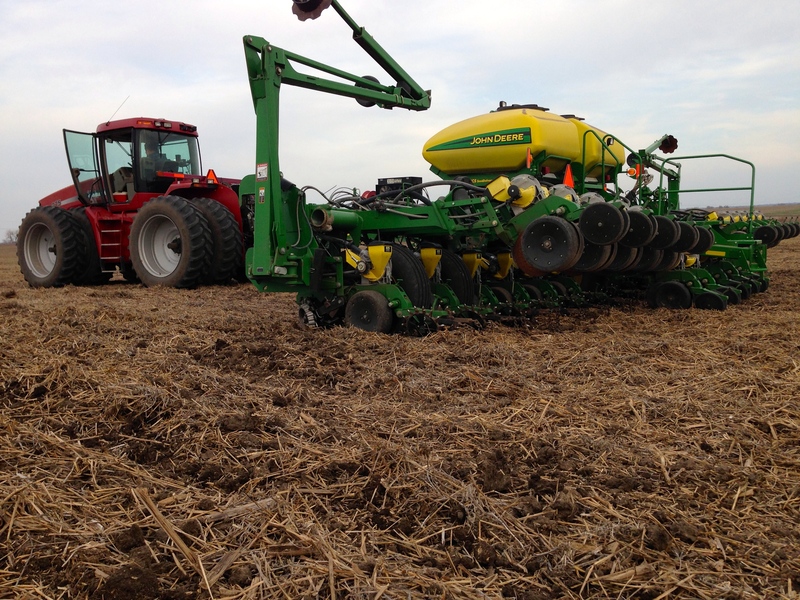 A drill does the same job as a planter- it puts seeds into the ground- but it does it a different way. 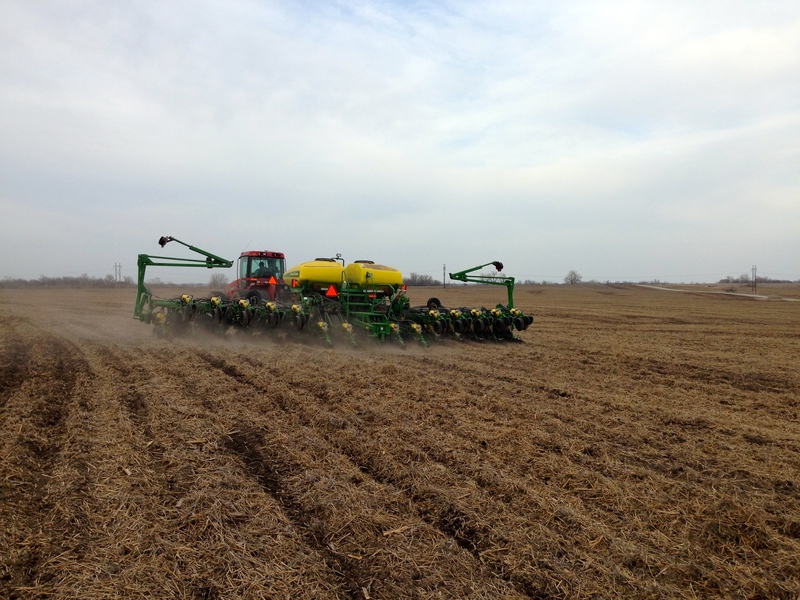 We use the drill to plant seeds that aren’t as picky about perfection, like wheat. Some of our soybeans are planted with the drill too. There simply aren’t enough hours in the day to plant everything with the planter. What about you? Are you as ready for spring as I am? !